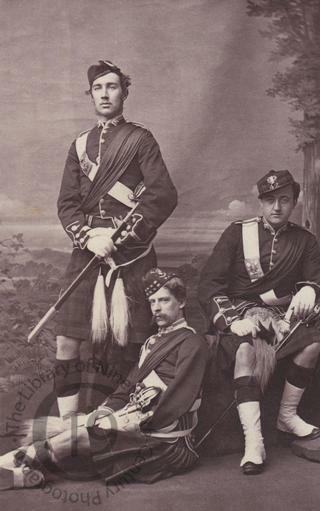 A carte-de-visite portrait of three officers serving in Highland regiments. The man seated on the ground is Henry Frederick Rowley (1839-1874), an Ensign with the 79th Highlanders (the Queen’s Own Cameron Highlanders) from 1861 to 1865 and then a Lieutenant with the 78th Highlanders (the Ross-shire Buffs). While serving in India he contracted hepatitis. Although he later served in Canada, he resigned from the army in 1870, shortly after his marriage, and died in 1874, aged only 35. The man seen here on the right is, according to his cap badge, serving in the 42nd Highlanders (the Black Watch) but is unfortunately unidentified, as is the third man.